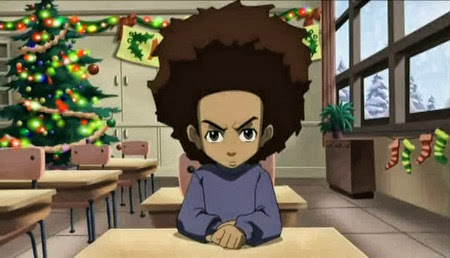 In the episode “A Huey Freeman Christmas,” Huey’s level of intellect is once again praised through another character’s actions towards him. Mr. Uberwitz, Huey’s teacher offers Huey the opportunity to direct the school’s Christmas play giving him complete creative control bound by a contract. The arrangement gives Huey the chance to express his views on Christmas and portray them to his school. While a great opportunity, Huey’s viewpoint unfortunately proves to be too much for the school’s administration and his creative control is revoked. This occurrence is significant in relation to Huey’s intellect because it puts Huey into yet another situation where he is presented with a task no normal ten year old could take on. Mr. Uberwitz was a full grown, educated adult who though a bit incompetent at interpreting and conveying information about other cultures was still in a position of authority at Huey’s school. The fact that he asked Huey, a ten-year-old with no credentials to take on the challenge of managing a school play, even agreeing to give him creative control via contract says a lot about the teacher’s perception of Huey’s intellectual capability. In this particular episode, McGruder seems to be emphasizing the point of how tapping into the experience in your surroundings can help you. Mr. Uberwits obviously was having trouble reaching his students, so utilizing one of them to create something that could touch all of them was a good way to do it. McGruder also seems to take a jab at how society has a very biased way of looking at Christmas. Though Huey was given complete control of the play, some of his more detailed changes such as the black Jesus caused him to lose his control. The reason for that loss of control reiterates the idea that we live in a society that is very much based on one-sided thinking. It also provided a harsh reminder for Huey, who despite his intellect, is still constantly mistreated in a society that just doesn’t understand him. Demetrius Coleman is an English major at SIUE and serving as a contributing writer for the Cultural Front this semester.